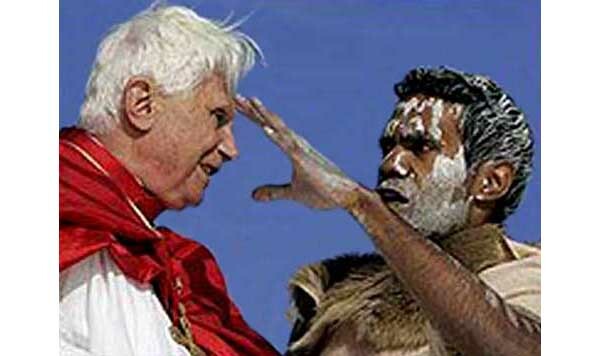 During his stay in Sydney for the WYD-2008, Benedict XVI received a kind of "blessing" from one of the many Aborigine witch doctors he met. Even though we don't know for sure the date this picture was taken, it was probably on the day of the final Mass where he allowed tribal customs to be part of the sacred liturgy. The Australian Indians enjoyed such broad liberty that it almost changed the tone of the WYD. Perhaps tribalism is a new component that Pope Ratzinger wants to introduce in the WYDs as part of his growing ecological concerns. Let's wait and see. Anyway, it seems quite difficult to believe that a true Vicar of Christ should be "blessed" by a pagan witch doctor, whose gods, according to the Gospel, are devils - Omnia dii gentium sunt daemonia [All the gods of the Gentiles are devils] (Psalm 95: 5).